Marshy swampy areas inundated with larvae? Sprinkle Mosquito Bits Quick Kill as a shock to quickly annihilate the larval population. Corn cob granules coated in Bti, the Bits (do not last long but) provide a punch, turning water black with larvae, to a clear pool void of future mosquitoes. A week after application either supplement with Mosquito Dunks, for long term control or continue to add Bits on a bi-weekly basis. 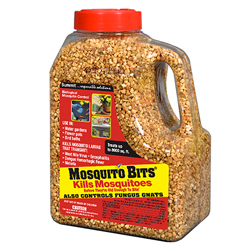 The Mosquito Bits are now labeled to control Fungus Gnats in plant beds or pots! Utilizing a similar mode of action for control of mosquito larvae, the Bits, either sprinkled on the soils surface or mixed with potting soil prior to planting will kill fungus gnat larvae with the same safety and target specific control offered for mosquito larvae.Quick Kill large mosquito populations.